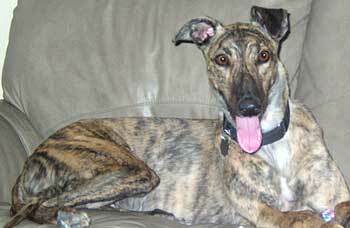 Betty Boop, aka RLM's Detonate, is a beautiful almost 3-year-old brindle female, born September 1, 2004. Her sire is Greys Flamebeau and her dam is RLM's Dynamite, making her grand sire Molotov. Betty Boop was found as a stray in the Cleburne area. 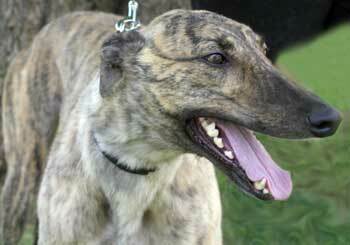 Greyhound-data shows no races to her credit, so her history is unknown. Betty Boop is positive to Ehrlichia at a fairly high titer, along with a positive titer for Babesia, and is being treated at this time. During her cat test, Betty Boop got in some good sniffs and was curious, but not aggressive. After a few minutes, she didn't care. The cats didn't care, either. Indoors, she passes. Of course, with cats outdoors, all bets are off. Cat testing day was no exception. When leaving, Dom, the big cat, went outside, too. As Dom was trotting along on the sidewalk, Betty wanted to give chase. She was on full sighthound alert at that point. So indoors, with her "own cats," Betty Boop is okay. Out on a walk, the foster and/or dog guardian needs to be aware that any little critter scurrying along is going to be of greyt interest! Betty Boop loves life and wakes up to a new day every day. She greets you with her "where have you been, I've had a wonderful nap, let's play" talk and smile in the mornings, and likewise when you come home. She is very curious and wants to be where you are. If you go to sit at the computer, be careful when you get up because more than likely she has sneaked up behind you, plopped down, and is waiting for the next adventure. When she follows you outside, she will put her head right in the same bush you are examining or try to help pull that weed that you are pulling. She is perfectly content to sit under the umbrella and listen to night sounds as well. She is wonderful on leash, loves her toys, and gets along with our alpha male as well as with our shy girls. She is fine with the blankie you provide and also likes her crate. She loves her treats and food and has been caught surfing but not taking food off the counters. It seems that she was treated harshly at some point in her life because yelling or pulling on her collar sends her immediately to the floor in submission and on occasion to potty a bit. A gentle correction is learned quickly. She shares toys well with others and can easily entertain herself with the toys when no one else is interested. She has mastered the doggie door and can go a long time without being taken outside. 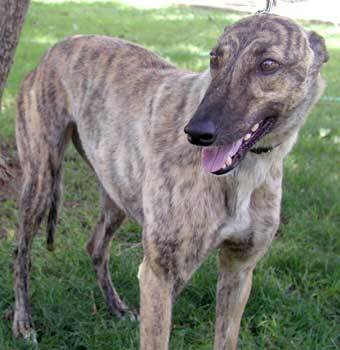 Betty is Ehrlichia positive and is taking medication but is expected to do just fine. She seems to be cat tolerant (but we know that only applies to inside cats).